The objective of this study was to establish a fast approach (< 1 h) for the evaluation of technical enzyme preparations (TEPs). 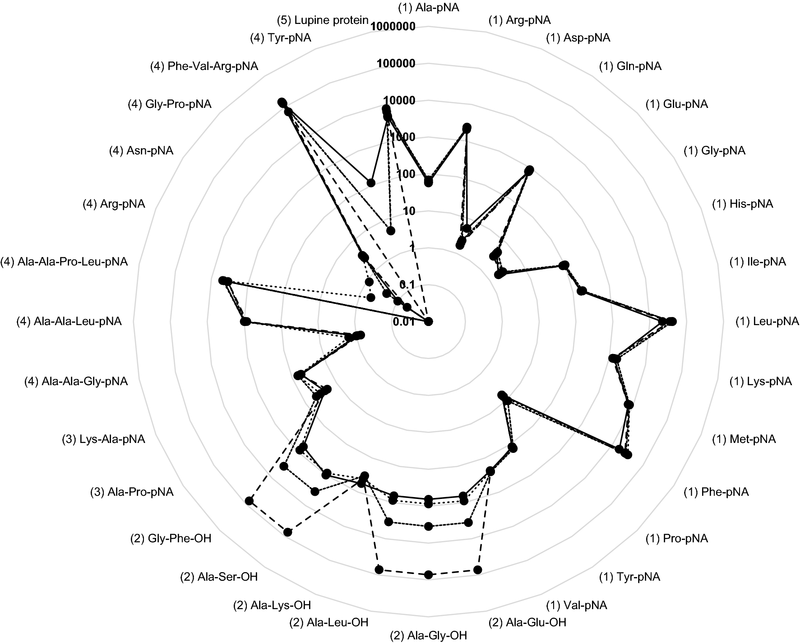 An automated photometric analyzer (GalleryTM Plus) was equipped with 32 synthetic and natural substrates to measure aminopeptidase, carboxypeptidase, dipeptidyl peptidase and endopeptidase activities distinguishably and the proteolytic activity towards lupine protein of TEPs. The established so-called “activity fingerprints” (AFPs) delivered detailed information about the substrate spectra and peptidase side activities, noticing furthermore batch variations of Flavourzyme1000L. Based on their AFPs, particular TEPs were selected for lupine protein hydrolysis and the hydrolysates were analyzed regarding the degree of hydrolysis and the free amino acids. It was demonstrated that the information of the AFPs were applicable to predict important properties of the resulting hydrolysates. Consequently, the hydrolysis efficiency was improved (increase of 47%). The system introduced enables the targeted selection of TEPs for enzymatic protein hydrolysis, resulting in specific food protein hydrolysates. The online version of this article ( https://doi.org/10.1007/s00217-019-03280-6) contains supplementary material, which is available to authorized users. The worldwide market offers various technical enzyme preparations (TEPs) and, due to their wide range of application (detergent, pharmaceutical, food and beverage industry), new preparations are added continuously [1, 2]. The food and beverage industry covers the major part of the enzyme market and is expected to grow from nearly $ 1.5 billion in 2016 to $ 1.9 billion in 2021, at a compound annual growth rate (CAGR) of 4.7% , the Grand View Research forecasting even 10.9% from 2016 to 2024 . Hydrolases (Enzyme Class 3) are the major class of enzymes which are used in industrial applications. Of them, peptidases (EC. 3.4) catalyze the hydrolysis of peptide bonds  and cover about one-third of the total enzyme market . The TEPs currently used in the food industry are derived mainly from microorganisms, such as Aspergillus spp. [6, 7, 8, 9] and Bacillus spp. [10, 11, 12, 13]. The TEPs, produced either by solid state or submerged fermentation, are formulated to enable an easy application. The enzymes are usually stabilized by the addition of carbohydrates, such as sucrose, dextrose and sugar alcohols , and preserved by commonly adding sodium benzoate or potassium sorbate. Solid product forms are produced by spray-drying the mixtures of enzymes, stabilizers and preservatives . According to the Food and Drug Administration, the enzyme preparations which are used in food processing contain one or several active enzymes that are responsible for the intended technical purpose in food production . However, TEPs are standardized either on one specific or an unspecific peptidase activity. Flavourzyme1000L (Novozymes A/S, Denmark), which is standardized by leucine aminopeptidase units (LAPU) using the synthetic substrate Leu-pNA is exemplary for the first. For the second, Promod278 (Biocatalysts Ltd., UK), which is standardized by casein protease units using a natural substrate casein, is exemplary. The data sheets of the TEPs state side activities, such as endopeptidase or glutaminase activities, only in some cases. The TEPs generally contain several enzyme activities due to different degrees of complexity in the cultivation of microorganisms (e.g., media, process conditions), different types of formulations and to avoid high purification costs [17, 18]. Although TEPs have been described as containing several practice-relevant activities [19, 20], a reliable approach for the fast determination of important specific activities is missing. Due to this lack, TEPs are commonly chosen without detailed information about their process performance or are termed imprecisely as exopeptidases or endopeptidases [21, 22, 23, 24]. In the present study, a fast measurement approach (< 1 h) was found to generate so-called activity fingerprints (AFPs) of TEPs. One AFP included 32 synthetic and natural substrates to determine specific peptidase activities of TEPs. Detailed and comprehensive information on the composition and proteolytic potential (endo- and exopeptidase activities) of a particular TEP was generated from this. 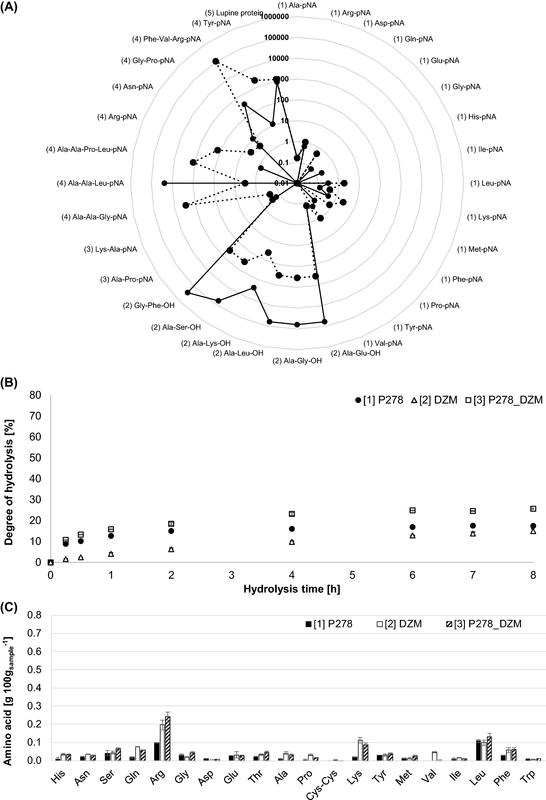 Furthermore, batch hydrolyses of lupine protein were subsequently performed and the degree of hydrolysis (DH) and the free amino acid profiles of the hydrolysates were analyzed. Lupine protein was chosen due to its good solubility and high content of essential amino acids . All chemicals were of analytical grade and were obtained from Merck Chemicals GmbH (Darmstadt, Germany) and Sigma-Aldrich (Taufkirchen, Germany). All para-nitroanilide (pNA) substrates were obtained from Bachem (Bubendorf, Switzerland). Soluble lupine protein isolate, which is derived from the seeds of blue lupins (Lupinus angustifolius), was obtained from Prolupin GmbH (Grimmen, Germany). The lupine protein isolate consists of 87–95% protein, < 7% ash, < 3% fat and < 1.5% fibers, according to the supplier’s information. The technical enzyme preparation (TEP) DeltazymAPS-M-FG originally derives from A. niger and was obtained from WeissBio Tech GmbH (Ascheberg, Germany). The TEPs Flavourzyme1000L and Alcalase2.4L were obtained from Novozymes (Bagsværd, Denmark) and derive from A. oryzae and B. licheniformis, respectively. Flavorpro750 MPD, Flavorpro766 MPD, Flavorpro839 MPD and Promod278 were obtained from Biocatalysts (Wales, UK). According to the supplier, Flavorpro750 MPD derives from A. oryzae. Flavorpro766 MPD and Flavorpro839 MPD are described as from “a mixed source” and “a microbial source”. Promod278 derives from B. subtilis. The TEPs Peptidase R and Protease P “Amano” 6SD were obtained from Amano Enzyme Inc. (Nagoya, Japan) and originally derived from R. oryzae and A. melleus, respectively. FoodPro51 FP was obtained from Danisco, DuPont (Wilmington, Delaware, US) and derives from A. oryzae. Four batches of the TEP Flavourzyme1000L were investigated (provided by the Nestlé PTC Food, Singen). The batch numbers were HPN01005, HPN01010, HPN01011, HPN02003 with storage times (production date to the time of the investigation) of 18, 12, 12 and 8 months, respectively. All TEPs were stored at 7 °C and protected from light. The automated photometric analyzer Gallery™ Plus (Thermo Fischer Scientific, Waltham, MA, USA) is commonly used for routine analysis in the food and beverage industry. This system was used in this study to establish a methodology for the determination of the enzyme activities of TEPs. Due to the programming capacity of this system, two different photometric assays (pNA and ortho-phthalaldehyde: OPA) were implemented. As shown in Fig. 1, the system is set up with two segments, one for samples (left) and one cooled segment (10 °C) for reagents (right). The sample segment consists of six sub segments, each with nine sample positions (54 sample positions in total). The reagent segment consists of 42 reagent vials. Two independent pipettors (sample and reagent) transfer samples and reagents into the cuvettes, where the reaction takes place. The cuvettes are in an incubator for incubation and measurement to ensure a defined temperature. After finalizing the programmed assay, the absorption is measured at the wavelength defined. According to the substrate, specific calibrations were defined in the assay protocol (see Table 1 in the supporting information for more information). An algorithm was used within the assay protocol to adapt the dilution (of the TEP) for each substrate automatically depending on the respective enzyme activity. This automatic dilution ensured that the measured activity was within the linear range of the deposited calibration. The concentration of product formed during the enzymatic reaction was calculated considering the specific dilution factor. The values were then transferred into an excel data library, where the enzyme activities were calculated and are therefore presented in all AFPs in nkat mL−1 TEP. A total of 32 substrates were selected, covering a wide range of different specific exo- and endopeptidase activities. Some have already been used for screening purposes and reported previously in literature [19, 20, 26]. The substrates were selected to cover four peptidase classes and the proteolytic activity towards lupine protein as a natural substrate: (1) aminopeptidases, (2) carboxy-/endopeptidases, (3) dipeptidyl peptidases, (4) endopeptidases and (5) proteolytic activity towards lupine protein. All available substrates (a total of 15) were selected to cover as many different (1) aminopeptidase activities as possible. The substrates (3) H-Ala-Pro-pNA and (3) H-Lys-Ala-pNA were selected to measure the activity of (3) dipeptidyl peptidases (DPP), for example, DPP2, DPP4, DPP5 [19, 27]. The substrates for the (2) carboxy-/endopeptidase activities included a protective group at the N- and C-terminal amino acids with different chemical properties (e.g., positively/negatively charged, aliphatic, aromatic) to distinguish the (2) carboxy-/endopeptidase activities from the (1) aminopeptidase activities. The terminology “carboxy-/endopeptidase activity” is used considering that endopeptidases might accept the carboxypeptidase substrates (although the substrates are protected from N-terminal digestion) and, thus, affect the carboxypeptidase activity results. The substrates for the (4) endopeptidase activities were selected to cover both specific activities, such as trypsin (using, e.g., Bz-Arg-pNA · HCl), and nonspecific activities, such as subtilisin (using, e.g., Z-Ala-Ala-Leu-pNA). Lupine protein was chosen to cover the (5) proteolytic activity towards a natural substrate. The exopeptidase (amino- and dipeptidyl peptidase) and endopeptidase activities were determined according to the method of Chrispeels and Boulter , with the following modifications. The assays were carried out using an automated photometric analyzer Gallery™ Plus (Thermo Fischer Scientific, Waltham, MA, USA) at 37 °C. A volume of 100 µL bis–tris-propane HCl (200 mM, pH 7.0) was mixed with 50 µL of pNA substrate and incubated for 60 s. A volume of 50 µL of diluted TEP sample (generally 10%, w/v for solid preparations, v/v for liquid preparations) was added and incubated for 600 s. The release of pNA was measured at 405 nm and 1 katal (kat) of peptidase activity was defined as the release of 1 mol pNA per second. Stock solutions of the respective pNA substrates were prepared in dimethylformamide with a concentration of 400 mM. The substrate solutions were dissolved in 10 mM HCl, or dimethylformamide to a final concentration of 4 mM or 40 mM, respectively, prior to the application. A detailed overview of the specific substrates and the solvent types are shown in Table 1 (supporting information). An overview of the pipetting scheme of the pNA assay using the programmed photometer is provided in Table 2 the supporting information section. The blank was measured using purified water (H2Odd) and performed in the same way as the pipetting scheme of the activity assay (Table 2 supporting information). The activity of the carboxy-/endopeptidases and the proteolytic activity towards lupine protein were measured indirectly by determining the generation of amino groups after derivatization with OPA. The method of Nielsen et al. was modified as follows. The assays were carried out using an automated photometric analyzer Gallery™ Plus (Thermo Fischer Scientific, Waltham, MA, USA). A volume of 20 µL bis–tris-propane HCl (200 mM, pH 7.0) was mixed with 10 µL of substrate and incubated for 60 s. A volume of 10 µL of diluted TEP (generally 10%, w/v for solid preparations, v/v for liquid preparations) was added and incubated for 600 s. A volume of 240 µL OPA Reagent (OPA Solution Complete, Sigma-Aldrich, Taufkirchen, Germany) was added, incubated for 30 s and the absorption was measured at 340 nm. An overview of the pipetting scheme of the OPA assay using the programmed photometer is provided in Table 3 (supporting information). The blank was measured using purified water (H2Odd) and in the same way as the pipetting scheme of the activity assay (Table 3 supporting information). The carboxy-/endopeptidase activities were measured at 37 °C using the synthetic substrates Z-Ala-Gly-OH, Z-Ala-Glu-OH, Z-Gly-Phe-OH, Z-Ala-Lys-OH, Z-Ala-Ser-OH and Z-Ala-Leu-OH. Further information concerning the specific substrates and the solvent types are shown in Table 1 in the supporting information section. l-glycine, l-glutamic acid, l-phenylalanine, l-lysine, l-serine and l-leucine, were used for the calibration, respectively. One katal (kat) of peptidase activity was defined as the release of 1 mol l-amino acid equivalents per s. The proteolytic activity on the natural lupine protein was measured using l-serine as a reference. One katal (kat) of peptidase activity was defined as the release of 1 mol l-serine equivalents per second. Batch hydrolyses of lupine protein were performed with several commercially available TEPs in 40-mL scale in Falcon tubes. The final substrate concentration was 10% (w/v) lupine protein isolate, suspended in bis–tris-propane HCl buffer (100 mM, pH 7.0). The final TEP concentration was 6% (v/v) or (w/v), depending on the type of formulation (liquid or solid) of the TEP in order to ensure equilibrium after 8 h of hydrolysis. The hydrolyses were performed at 37 °C and 850 rpm by using ThemoMixerC (Eppendorf, Hamburg, Germany). Samples of 800 µL were taken after various times and transferred into Eppendorf tubes containing 200 µL trichloroacetic acid (2.5 M) to terminate the reaction. 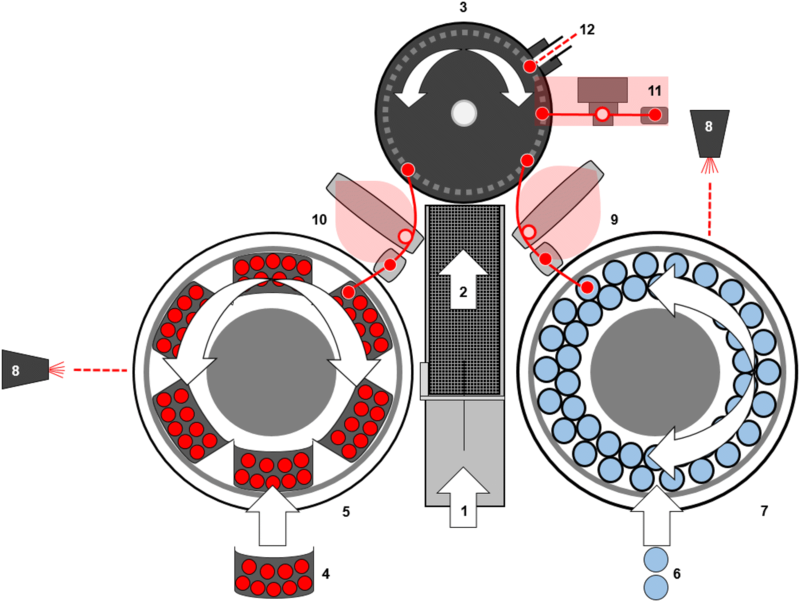 The samples were shaken at 3000 min−1 for 3 s using a universal shaker (MS3basic, IKA®, Staufen, Germany) and centrifuged at 14,100 rcf for 3 min (MiniSpinPlus, Eppendorf, Hamburg, Germany). The samples were diluted as required to determine the DH (see “Manual determination of the degree of hydrolysis with ortho-phthalaldehyde in batch hydrolysates”) or analyze the free amino acid profile via ultra-performance liquid chromatography (UPLC) (see “Ultra-performance liquid chromatography analysis for the free amino acid profiles of the lupine protein hydrolysates”). As a reference, the substrate suspension without TEP was treated and measured in the same way as the sample suspensions with TEP. Both the substrate for the hydrolyses (lupine protein) and the TEPs themselves were analyzed for their DH and free amino acids and subtracted from the batch hydrolysate samples. Consequently, only the product release caused by the enzymatic liberation was captured. Total free amino acid concentration of the TEPs ranged between 0.02 and 0.2 g 100 g−1 and the total free amino acid concentration of the substrate suspension (lupine protein) was 0.1 g 100 g−1. Primary amino groups were determined after derivatization with OPA, according to the method of Nielsen et al. , with some modifications. A sample volume of 25 µL was transferred into a microtiter plate and 175 µL OPA Reagent (OPA Solution Complete, Sigma-Aldrich, Taufkirchen, Germany) was added. The plate was incubated at 24 °C for 10 s and shaken for 10 s. The absorbance was measured at 340 nm using a UV–Vis multimode microplate reader (SpectraMaxM5, Molecular Devices, Sunnyvale CA, USA). l-serine was used as a reference for the calibration. The maximum concentration of free amino acids at complete hydrolysis (Eq. 2) is described as the protein concentration that is hydrolyzed cprotein (g L−1) divided by the difference of the average molecular mass of the amino acids in lupine protein M* (137.9 g mol−1) and the molecular mass of water MH2O (18.0 g mol−1). The lupine protein-specific average molecular mass was calculated by considering the lupine protein amino acid composition . The molecular mass of water was subtracted, since water is added during the hydrolysis of a peptide bond. The free amino acids of the lupine protein hydrolysates were determined by UPLC, as described previously . An Acquity® UPLC H-Class System (Waters, Milford, USA) was used equipped with a quaternary solvent manager (QSM), a sample manager with Flow-Through Needle (FTN), a column heater (CH-A) and a photodiode array (PDA) detector. A Waters AccQ·Tag™ Ultra RP Column, Acquity® UPLC Ethylene-Bridged-Hybrid (BEH) C18 (pore diameter 130 Å, particle size 1.7 µm, inner diameter 2.1 mm, length 100 mm) column was used. Norvaline (Sigma-Aldrich, Taufkirchen, Germany) was used as an internal standard with a concentration of 25 µmol L−1 (1:100 stock solution 2.5 M in 0.1 M HCl). The column temperature was 43 °C and the sample temperature was 20 °C. The injection volume was 100 µL. The eluent gradient, the flow rate (0.7 mL min−1) and the detection wavelength (260 nm) were applied according to the recommendations of Waters Corporation . The samples of the batch hydrolyses were measured in duplicate using two independent measurements. The data were evaluated with the standard deviation calculated with Excel (Microsoft, Redmond, USA). The measurements for the AFPs of the TEPs were performed in single determination due to economic reasons and screening intentions. The AFP measurements of Flavourzyme1000L batch HPN02003 were performed exemplarily in triplicate to show the deviation of the assays in the automated screening system. Figure 1 (supporting information) shows the coefficients of variation (CV) of the 32 substrates. The measurements using the substrates Z-Asn-pNA, Bz-Phe-Val-Arg-pNA, Z-Ala-Lys-OH, lupine and Z-Ala-Ser-OH showed CVs above 15%. The CV for the substrate Z-Asn-pNA above 15% was negligible since no enzyme activity was measured. The CVs regarding the substrates Z-Ala-Ser-OH, Z-Ala-Lys-OH and Bz-Phe-Val-Arg-pNA, and the natural lupine protein was due to poor solubility of the substrates in the assay. Furthermore, the small volumes of the pipetting scheme of the OPA assay, which were due to the setup limitations of the Gallery™, could have contributed to the CVs. The limit of detection (LOD; defined as 3 × standard deviation of the blank) and the limit of quantification (LOQ; defined as 10 × standard deviation of the blank) values for the enzyme activities in the AFPs were calculated for each assay and can be found in Table 4 in the supporting information. Technical enzyme preparations are used in a wide range of applications in the food industry and usually consist of enzyme(s), stabilizers and preservatives. The knowledge about the TEPs’ substrate spectrum and potential side activities is limited but crucial for their selection for process application. Technical peptidase preparations are especially known to present more than one kind of enzyme activity. Therefore, a fast system was established to create AFPs of TEPs to provide detailed information of the substrate spectrum and activity profiles from technical peptidase preparations. The automated photometric analyzer Gallery™ Plus (Thermo Fischer Scientific, Waltham, MA, USA) is generally used for routine analysis in the food and beverage industry. In the present study, the Gallery™ Plus was used to establish a methodology for the determination of enzyme activities of TEPs. The methodology established delivers a fast approach (32 assays are performed in less than 1 h, depending on the number of dilutions) to evaluate TEPs comprehensively for their variety of activities while measuring both exo- and endopeptidase activities. According to our experiences, the automated system is approximately 6–8 times faster than the manual measurement of all activities (32 substrates). Please refer to the description of the measurement approach in “Determination of the enzyme activities by the novel measurement approach” for detailed information concerning the Gallery™ setup. By performing batch hydrolysis of lupine protein, it was further demonstrated that the information generated based on the AFPs can be used to select TEPs specifically for hydrolysis and to combine TEPs according to process targets (e.g., DH, free amino acids). The AFPs of different batches of the TEP Flavourzyme1000L were created by implementing the novel measurement approach and the results are shown in Fig. 2. The peptidase activities are placed in five different groups referring to (1) aminopeptidase activity, (2) carboxy-/endopeptidase activity, (3) dipeptidyl peptidase activity, (4) endopeptidase activity and (5) the proteolytic activity towards lupine protein as a natural substrate. The activities are displayed in nkat mL TEP−1 in logarithmic scale ranging from 10 pkat mL−1 to 1 mkat mL−1. The current values for the enzyme activities were additionally provided in Table 5 (supporting information) for the sake of completeness. Please refer to the statistical analysis Sect. 2.5 for the LOD and LOQ values. Flavourzyme1000L exhibited activities on all 15 (1) aminopeptidase substrates with its leading activity towards (1) H-Leu-pNA, as is declared by the supplier. The activities towards (1) H-Leu-pNA were 35 µkat mL−1, 41 µkat mL−1, 41 µkat mL−1 and 22 µkat mL−1 for the Flavourzyme1000L batches HPN01005, HPN01010, HPN01011 and HPN02003, respectively. Similar values of 20.3 ± 0.4 µkat mL−1 (37 °C, pH 7.5) have been reported and accounted to 1102 ± 9 LAPU g−1 (37 °C, pH 8.0, 0.2 mM ZnCl2) for a comparison with the manufacturer’s specification of 1000 LAPU g−1 . Apart from this main activity (LAPU g−1), the AFPs of the Flavouryme1000L batches showed variations regarding all (2) carboxy-/endopeptidase activities, for example, towards (2) Z-Ala-Glu-OH, ranging from 0.7 (HPN02003) to 72 µkat mL−1 (HPN01005). Further variations were measured regarding (4) endopeptidase activities, for example, towards (4) Bz-Arg-pNA and (4) Bz-Tyr-pNA, referring to trypsin-like and chymotrypsin activities as described in the literature, respectively [35, 36]. Batch-to-batch variations have been reported previously but only investigating the endopeptidase activity using azocasein as a substrate . The novel measurement approach presented in this study generated activity patterns (AFPs) of TEPs with more precise information on specific peptidase activities (exo- and endopeptidase activities) and illustrates more clearly, therefore, specific peptidase side activities and batch variations (e.g., in the case of Flavourzyme1000L, several (2) carboxy-/endopeptidase and (4) endopeptidase activities). Due to the increasing number of enzyme preparations on the market, their appropriate selection has gained in importance [3, 4]. Table 1 shows an example of the information provided concerning three commercially available TEPs: Flavorpro750 MPD, Flavorpro766 MPD and Flavorpro839 MPD. These three TEPs show apparent differences in their specified activities, sources and pH-dependent activity and are presented differently in their general descriptions. The respective AFPs of these TEPs, investigated by the novel measurement approach, illustrated the peptidase activity patterns (Fig. 3). Despite small quantitative differences, the three TEPs displayed similar activity patterns under the conditions tested. All three TEPs contained several exopeptidase and endopeptidase activities in similar activity ranges (see Table 5, supporting information for the current values). The information generated by the measurement approach delivered a detailed and comprehensive description of the TEPs’ activities. Therefore, the AFPs help to choose appropriate TEPs for application and minimize the number of experiments using only preselected TEPs. As an example, if different protein hydrolysates are targeted, it is of advantage to also choose TEPs with different AFPs. The AFPs of the TEPs Flavourzyme1000L and Alcalase2.4L are presented in Fig. 4a. Although Flavourzyme1000L has been investigated intensively in literature , further information on substrate specificity was obtained with the AFPs in this study. Alcalase2.4L exhibited negligible or low (1) exopeptidase activities, but noticeable (2) carboxy-/endopeptidase and (4) endopeptidase activities. Low aminopeptidase activity and mainly endopeptidase activity of Alcalase2.4L have been reported previously . In this study, both AFPs of Flavourzyme1000L and Alcalase2.4L delivered more detailed information on their activity profiles than has been published previously. The current values of the enzyme activities are provided in Table 6 in the supporting information section. 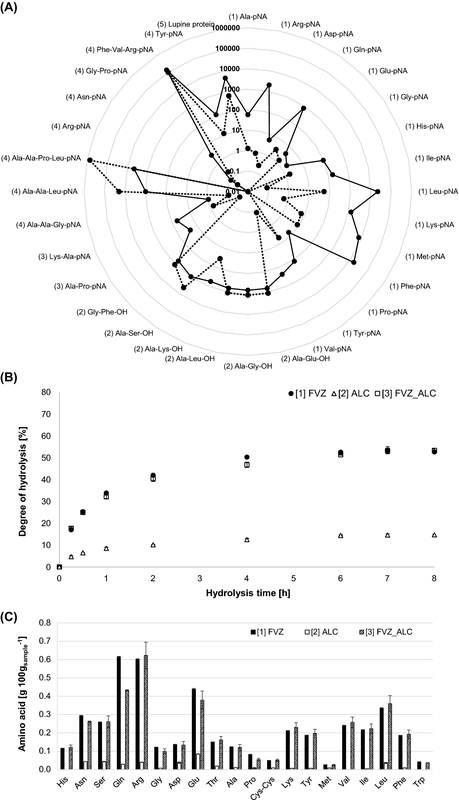 Batch hydrolyses of lupine protein were conducted to establish a relation between the information of the AFPs and the performance of TEPs in protein hydrolysis. The lupine protein hydrolyses were carried out with  Flavourzyme1000L,  Alcalase2.4L and  a combination of Flavourzyme1000L and Alcalase2.4L in a ratio of 1:1 (Fig. 4b). The hydrolysis using Flavourzyme1000L resulted in a degree of hydrolysis of 52.62 ± 0.14% after 8 h (DH8h), which could be explained by the complex mixture of exo- and endopeptidase activities of Flavourzyme1000L. The hydrolysis with Alcalase2.4L, containing fewer exopeptidase activities and mainly endopeptidase activities (see AFP of Alcalase2.4L, Fig. 4a), resulted in a DH8h of 14.70 ± 0.22% (Fig. 4b). The combination of Flavourzyme1000L and Alcalase2.4L has been reported to increase the DH using potato protein and anchovy powder [21, 22, 38]. However, due to the information generated from the AFPs in this study, a combination of Flavourzyme1000L and Alcalase2.4L was not expected to increase the DH8h. This was confirmed by the DH8h of the TEP combination with 53.35 ± 0.73%, showing no significant increase compared to DH8h = 52.62 ± 0.14% using Flavourzyme1000L only. 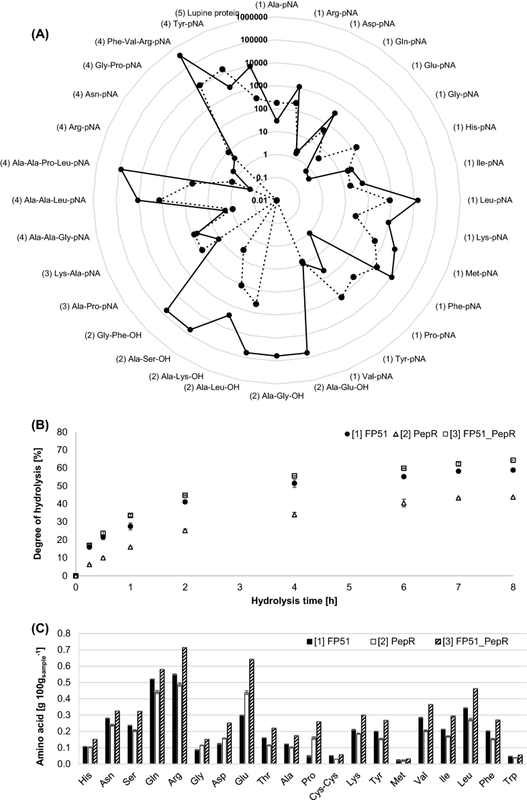 The lupine protein hydrolysates were analyzed for their free amino acid profiles by UPLC (Fig. 4c) to investigate the coherence of the information of the AFPs regarding the release of free amino acids during hydrolysis. Several free amino acids were generated which can be related to the exopeptidase activities shown in the AFP of Flavourzyme1000L (Fig. 4a). By contrast, the hydrolysates of Alcalase2.4L showed negligible amounts of free amino acids, which can be explained by the lack of exopeptidase activities (AFP of Alcalase2.4L, Fig. 4a). The combination of Flavourzyme1000L and Alcalase2.4L did not increase the release of free amino acids, but showed similar values as was achieved with Flavourzyme1000L on its own. These findings demonstrated that the AFPs delivered valuable information about the TEPs’ characteristics, which could be transferred to their hydrolysis characteristics. Consequently, TEPs for protein hydrolysis could be selected more rationally by their AFPs, rather than based on the general information provided by the suppliers. Based on the assumption that a hydrolysate composition might be predicted from the AFPs, it was, furthermore, investigated whether the DH could be improved by the selection and combination of TEPs with complementary activities. Therefore, TEPs with different peptidase activity patterns were chosen to perform batch hydrolysis of lupine protein. The TEPs were selected based on the complementary activities shown in their AFPs (see Table 6, supporting information for the current enzyme activity values). In the first example, P278 and DZM were combined based on complementary (4) endopeptidase activities. In the second example, FP51 and PepR were combined based on complementary (1) exopeptidase activities. The respective Figs. 5 and 6 were set up the same as Fig. 4, showing the AFPs of the TEPs used [A], the DH during lupine protein hydrolysis [B] and the analysis of the free amino acids of the resulting lupine protein hydrolysates after 8 h process time [C]. A random regression forest was applied to relate the single activities to the values of DH. Due to the high complexibility, no clear correlation was observed in this point. Nevertheless, a relationship between the activities of the peptidase classes and the values for DH were observed. Both AFPs of the TEPs Promod278 (P278) and DeltazymAPS-M-FG (DZM) exhibited mainly (2) carboxy-/endopeptidase and (4) endopeptidase activities and were complementary in some of the activities (see Fig. 5a). The DZM displayed higher activities for the (2) carboxy-/endopeptidase activities and higher activities for the remaining (4) endopeptidase activities towards (4) Z-Ala-Ala-Leu-pNA and (4) Z-Gly-Pro-pNA, P278. The hydrolysis of lupine protein using P278 resulted in a DH8h of 17.42 ± 0.23% and a DH8h of 14.94 ± 1.03% using DZM (Fig. 5b). The combination of P278 and DZM increased the DH8h to 25.62 ± 0.31%, which is an overall increase of 47%. Due to the lack of exopeptidase activities for both P278 and DZM (see AFPs, Fig. 5a), the generation of free amino acids was negligible (Fig. 5c). The rational combination of two complementary TEPs containing mainly (2) carboxy-/endopeptidase and (4) endopeptidase activities has been shown to improve the hydrolysis efficiency (Fig. 5b) without generating more free amino acids (Fig. 5c). Free amino acids might not be desired in some applications (e.g., milk hydrolysates for hypoallergenic products) since they have been reported to have an impact on flavor [39, 40, 41]. The AFPs of FP51 and PepR both showed several exo- and endopeptidase activities (Fig. 6a) and were chosen because of their complementary exopeptidase activities. 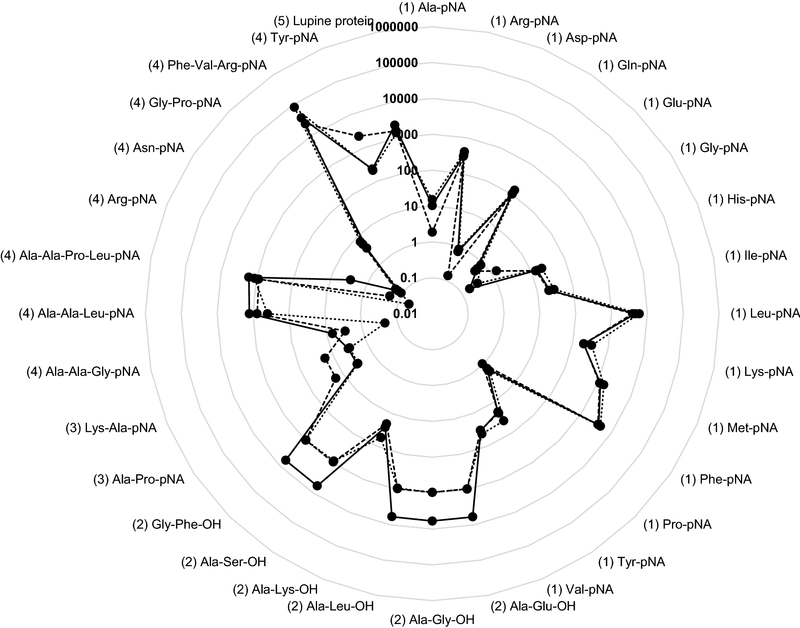 PepR displayed higher activities towards (1) aminopeptidase activities, such as (1) H-Ala-pNA, (1) H-Glu-pNA, (1) H-Gly-pNA, (1) H-Pro-pNA and (1) H-Tyr-pNA. By contrast, FP51 displayed higher activities towards the other ten (1) aminopeptidase substrates. The hydrolysis of lupine protein (Fig. 6b) resulted in a DH8h of 43.83 ± 0.45% and 58.84 ± 0.32% for PepR and FP51, respectively. The increased DH8h of FP51 could be explained by the higher absolute activities towards a wider substrate specificity in comparison to PepR. However, the combination of FP51 and PepR resulted in an increase of DH8h to 64.33 ± 0.14%. This total increase of 9% might be explained by the complementary exopeptidase activities (Fig. 6a). Since both TEPs exhibited exopeptidase activities, free amino acids were generated during hydrolyses using FP51 and PepR (Fig. 6c). Tendencies for a correlation between the activities of the AFP and the generation of free amino acids could be drawn. The aminopeptidase activity indicated tendencies to correlate with the amount of its respective amino acid in the hydrolysate in 12 out of 15 cases. FP51, for example, exhibited a higher activity towards H-Leu-pNA (AFP, Fig. 6a) and resulted in a higher release of free leucine (Fig. 6c). PepR exhibited a higher activity towards H-Pro-pNA and resulted in a higher release of free proline. These findings showed that the process efficiency of the hydrolysis was increased by choosing the TEP based on its AFP. Furthermore, the hydrolysis could be guided to release specific amino acids of interest, for example, increase the amount of dietary-essential amino acids. In this study, a reasonable fast approach was presented to comprehensively evaluate TEPs for an efficient protein hydrolysis at pH 7 and 37 °C. However, the assay conditions can be adapted if other process parameter are targeted, leading to respective results. By implementing the novel measurement approach, AFPs of TEPs were created delivering detailed information on substrate specificity and peptidase activities towards 32 synthetic substrates and one natural substrate: 15 aminopeptidase activities, six carboxy-/endopeptidase activities, two dipeptidyl peptidase activities, eight endopeptidase activities and one proteolytic activity towards lupine protein as a natural substrate. Depending on the TEP, the measurement of an AFP could be performed in less than 1 h and 6–8 times faster than the manual determination (according to our experience). It was shown that the novel information generated by the AFPs increased the knowledge regarding the substrate specificity and peptidase side activities (including batch variations) of the TEPs to choose predictably the most suitable TEP for a targeted protein hydrolysate. The information generated by the AFPs was used to anticipate the outcome of a lupine protein hydrolysis and the generation of free amino acids. Consequently, TEPs were applied more systematically to protein hydrolysis based on their AFP. Thus, a more efficient hydrolysis process was achieved (e.g., DH) leading to specific protein hydrolysates with desirable and predictable attributes (e.g., free amino acids) and higher yields. The novel approach might be useful for a greater efficiency of TEPs when applied in industrial processes. 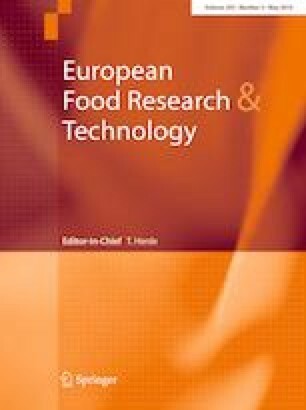 The authors gratefully acknowledge the Nestlé PTC Food, Singen, Germany, for supporting this research. This research does not contain any studies with human participants or animals performed by any of the authors.